From our well-read friends at the California Contractors State License Board . . .
SACRAMENTO – Californians will reach out to a contractor for installing new fenestration fixtures like windows, exterior doors, or skylights hoping to save energy in their home. But, in the case of low-rise residential buildings, there are labeling requirements that contractors need to follow when installing manufactured fenestration products. According to Section 110.6 of California’s 2016 Building Energy Efficiency Standards (Energy Standards), prescribed by the California Energy Commission (Energy Commission), contractors need to make sure the appropriate certification labels are visible upon installation. Certified NFRC labels should reflect values for the U-factor, Solar Heat Gain Coefficient (SHGC), Visible Transmittance (VT), and Air Leakage. The NFRC’s website has a database of manufacturers who participate in their program, making it easier for contractors to find certified products. It’s important to also note that manufacturer-generated performance values do not comply with California’s Energy Standards and will not be will not be accepted by building inspectors (i.e. Simulated Performance Alternative” values). For additional questions on this topic or for more general information regarding California’s Energy Standards, contact the Energy Standards Hotline at (800) 772-3300 (in California), or (916) 654-5106 (out of state), or email title24@energy.ca.gov. 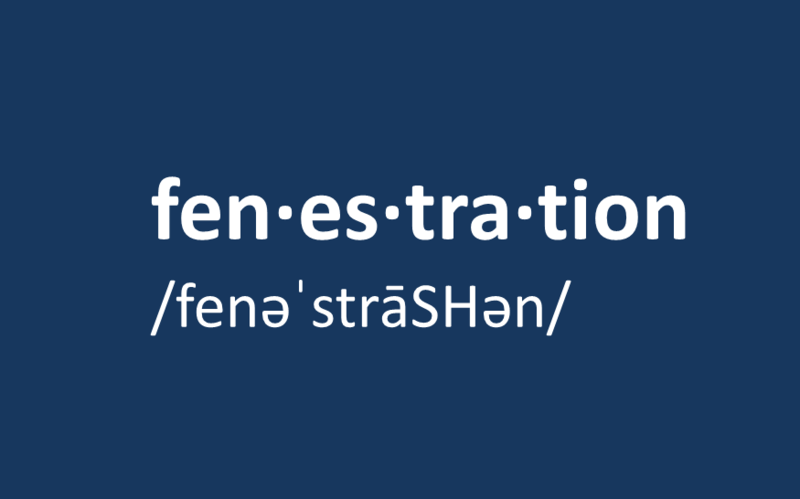 How about “Defenestration” . . . which is loosely defined as the act of throwing somebody OUT of a window. Although “fenestration” has Latin roots, defenestration was coined in the city of Prague circa 1600 when townsfolk became unhappy with their governing representatives, and in the absence of recall petitioning (they couldn’t vote anyway) shortened the process by literally throwing a couple of those bums out of a window at the Prague Castle. (Voter recount provisions had not yet been invented either). That particular historical act also started a war; so as appealing (and decidedly effective) as that process may be in certain circumstances . . . “Hello . . . Thanks for seeing me in your office today. Say, it’s a little stuffy in here, can we open a window . . .” ? I know someone we need to defenestrate . . .